Hailey Baldwin, the sensational teenage model and the daughter of famous actor Stephen Baldwin, is much of a tattoo addict. Hailey Baldwin is the queen of teeny tiny tattoos, and she keeps on adding tiny body inks in her huge list of tattoos. So here is the list describing when and why of her tattoos. Inked in January 2015, this is Baldwin’s first tattoo. This very first tattoo was inked by New York-based tattooist, Jon Boy. The Roman numeral tattoo stands for June 10, 1990, which is the date when her parents got married. Describing her gun tattoo, she revealed that, “I don’t know why I have this tattoo. Just another story to tell lol. 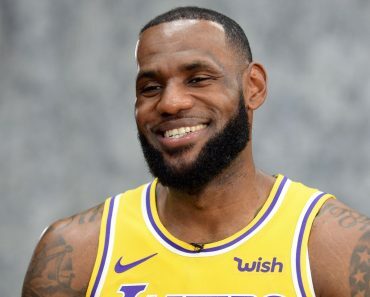 It is what it is”. Right in the middle of her middle finger, this gun tattoo was inked by the same NYC tattooist, Jon Boy. Just after getting her first tattoo, she got this tattoo inked on the back of her ankle. This abstract tattoo is a small yet a simple one to add on to her grace. This teenage girl may look small and young but has a heart that is full of compassion and love for others. This “g” tattoo is yet another example to describe her care. “G” stands for the daughter of Megachurch Pastor Van Veach, Georgia, who was born with a rare brain disorder called Lissencephaly. This tattoo was again inked by Jon Boy. It looks like Jon Boy is her favourite tattooist, that is why she again got inked by Jon Boy but this time with her cousin, Ireland who is also her best pal. 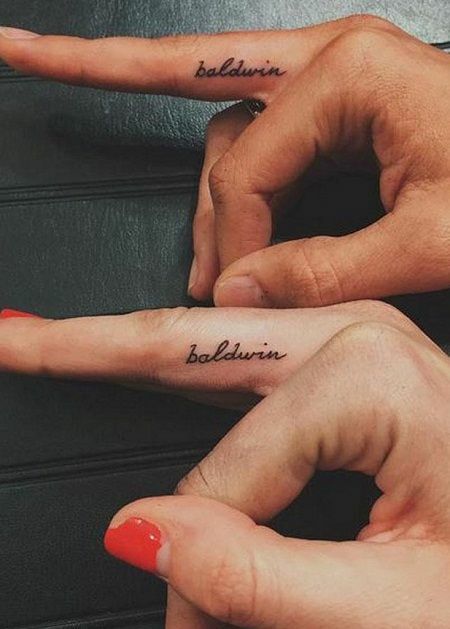 They both got the same tattoo “Baldwin” inked on their middle finger. 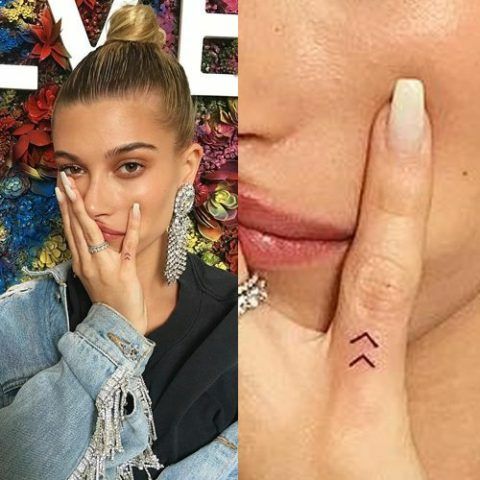 In August 2015, Hailey Baldwin along with her BFF, Kendall Jenner took another visit to the tattooist for yet another tattoo on their middle finger. This time choosing a broken heart, with Hailey opting for red ink and Kendall for white ink. In May 2016, during a vacation, Hailey along with Mari Mckinney got matching BFF tattoo. Hailey and Mari, got “gente” tattoo inked on left hip and left ribcage respectively. 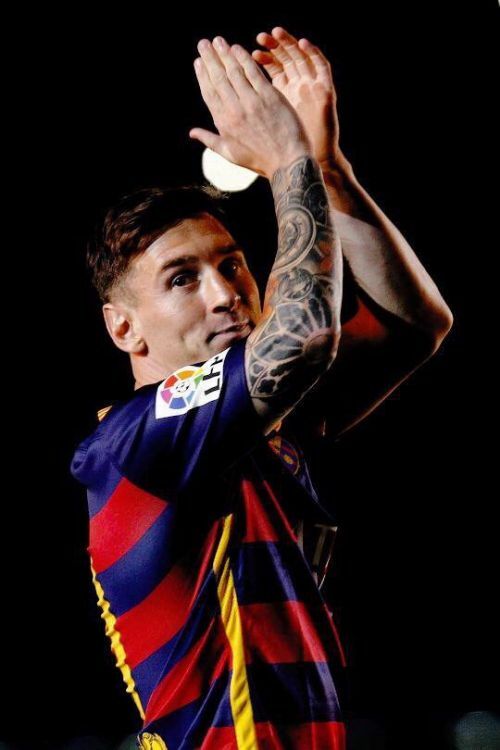 ‘gente’ is a Portuguese word that means people. This tattoo is also a tribute to Hailey’s mother whose native language is Portuguese. This tattoo was again inked by Jon Boy. This tattoo is inked in a grey font on both of her index fingers. This tattoo was designed by her girl pal, Kendall Jenner, which depicts the universal sign of praying by bringing up both the hands together. 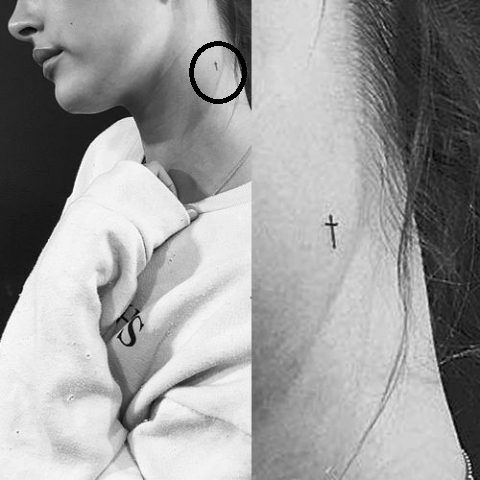 In October 2015, Hailey got “Minas Gerais” inked on her left ankle. The tattoo was inked by Jon Boy. “Minas Gerais” is a state in Brazil. Hailey has 3 black dots inked on the middle finger of her left hand. This tattoo inked by Jon Boy represents suspension points. 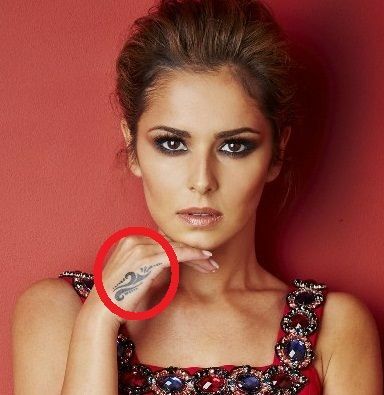 There is a tiny star outline inked on the index finger of her right hand. Inked by Jon Boy. Hailey got “seek” inked by Jon Boy in a beautiful black cursive script. 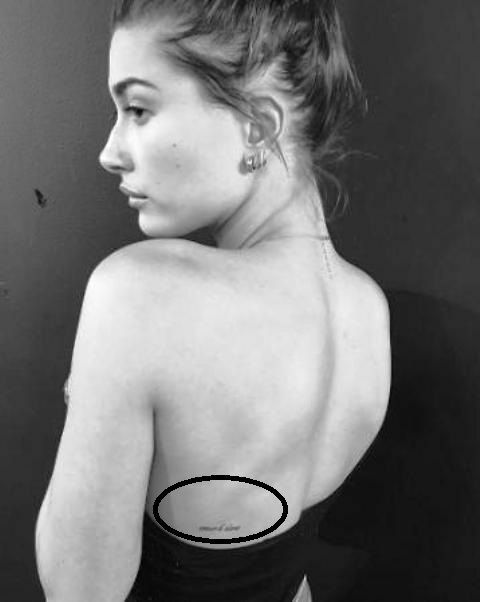 In August 2016, Hailey got a “K” (which perhaps stands for Kendall, her BFF) inked on her left-hand index finger and “3:30” inked on her right hand, which is in reference to a Biblical passage, John 3:30. “He must become greater and greater, and I must become less and less, John 3:30“. 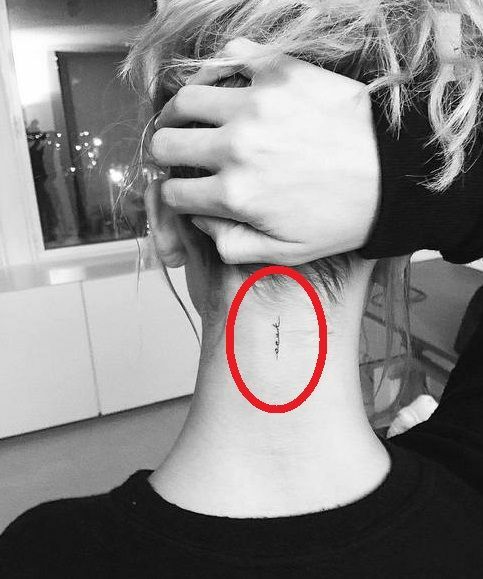 In October 2016, Hailey got a very small tattoo inked on her spine, which reads “unseen“. The tattoo artist, Jon Boy, explained this tattoo by tagging the Bible reference 2 Corinthians 4:18, which reads: “So we fix our eyes not on what is seen, but on what is unseen, since what is seen is temporary, but what is unseen is eternal“. Baldwin has got a teeny script reading “coeur d’Alene” under her left shoulder blade. This tattoo shows her love for her sister Alaia, since its Alaia’s middle name. A tiny ink is inscribed in the shape of a cross on the side of her neck. Hailey has faith in her religion, and that is why she has got this tattoo. 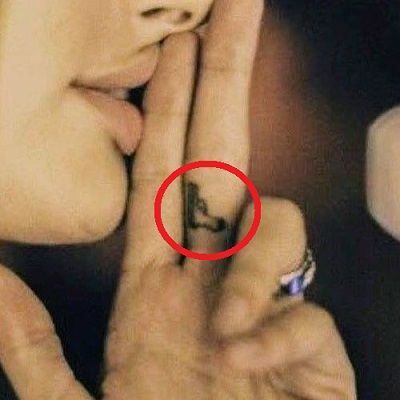 Hailey has got a unique tattoo in the form of two arrows on the little finger of her right hand. And again this ink is done by Jon Boy.